Following his Oscar-winning turn as Stephen Hawking in James Marsh’s The Theory of Everything (2014), British actor Eddie Redmayne makes his bow on the Venice Lido in Tom Hooper’s The Danish Girl (2015), complete with another transformative portrayal – this time of a Danish painter who slowly realises his true identity as a woman. It’s the 1920s and Einar Wegener (Redmayne) is a moderately successful landscape painter who obsessively paints the same vista from his childhood time and again: a bog, a line of trees, the mountains beyond. His wife Gerda (Alicia Vikander) is a thoroughly modern type who paints portraits and smokes cigarettes in her cigarette holder. Gerda is generally supportive of her husband but longs for her own breakthrough as well as a child. They live in their spacious artist’s garret and seem happily in love, lustily enjoying each other with healthy regularity. However, Einar hides a secret. He has a feeling for girl’s clothes, getting into a tizz at the feel of taffeta, and when he lends a leg in stockings so that Gerda can finish a portrait the game-playing becomes a bit more extreme and Einar accompanies Gerda to the Artist’s Ball cross-dressed as a visiting cousin, Lili. Here, there’s one of many awakenings as Einar manages to convince as a slightly gauche and croaky woman while also experiencing firsthand the male gaze. Gerda initially finds in the play-acting an outlet for her own artistry, using Lili as a model and garnering the long sought-after break, but it soon becomes evident that Einar (or Lili) isn’t playing at all. He attracts the attention of a young gay artist called Henrik (fellow Brit Ben Whishaw) and a relationship ensues, but Einar resists his impulses and seeks medical attention as stomach complaints and nasal bleeding suggest that he’s having a kind of sympathetic menstrual cycle. The unenlightened medical theories of the time are put through the wringer. In the end, Gerda takes the decision to use her new found fame and prosperity to take Einar to Paris where they’ll both be left unmolested. Adapted by Lucinda Coxon from the bestseller by David Ebershoff, there’s a valid film to be made here about a heroic figure of the transgender movement. However, Hooper continues to burnish his prestige cinema credentials following the successes of The King’s Speech (2010) and Les Misérables (2013), shooting a film that is overwhelmed by its own visual wealth. Costume and make-up Oscar nominations could be posted immediately as the film foregrounds these elements as part of its narrative. Danny Cohen’s cinematography aspires to a painterly beauty but there are moments when the sumptuousness becomes intrusive – the tactile fetishism a little dull. Vikander is initially annoying in an over-fussy performance, a bit like a young Emma Thompson, but later on her humour becomes a necessary antidote to the high melodrama that drowns the stage with tears. Redmayne, by contrast, seems lost in the role and not only due to his initial gender confusion. Just as feminists occasionally rail against transvestites for reproducing a misogynistic performance of womanhood, so Redmayne bats his eyelids and flashes a nervous smile, looking for all the world like Jessica Chastain with a very narrow emotional range. This sexism is extended to Gerda’s ostensibly modern woman whose only role in life seems to be to complete her husband’s desire and whose art is a flop until he steps in as Lili. In Paris, Einar / Lili is reunited with her old childhood friend Hans (Matthias Schoenaerts) who along with Gerda, supports her in her decision to undergo pioneering and highly dangerous gender realignment surgery. From this stage on, the tears flow endlessly. Alexandre Desplat’s trademark galloping piano (can we please have one British film without a trilling piano in the score?) rises to crescendo after crescendo but the effect is so manipulative as to become counterproductive. 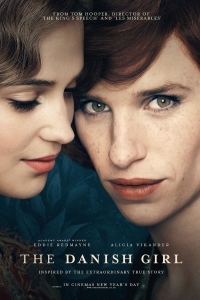 The Danish Girl is as handsome yet disappointingly flat as a painting on a chocolate box. It should certainly be applauded for bringing to light an unsung hero of the transgenderism, but in its unremitting tastefulness and sentimentality – even a beating has beautiful setting and a lovely bit of blood – it ultimately left this reviewer as cold as a dip in a Danish bog.